CBF images representing the 6 analyzed sections from subject 4. A, Axial FLAIR images, T1-weighted images, cortical gray matter CBF images, subcortical CBF images, and global CBF images combining all gray and white matter at the level of the basal ganglia and thalamus (above) and at the level of cerebral white matter (below) from subject 4. B, Corresponding images from subject 18. On the CBF images, note that the cerebral cortex, the cortical-subcortical transition, and the thalamus are highly perfused structures. 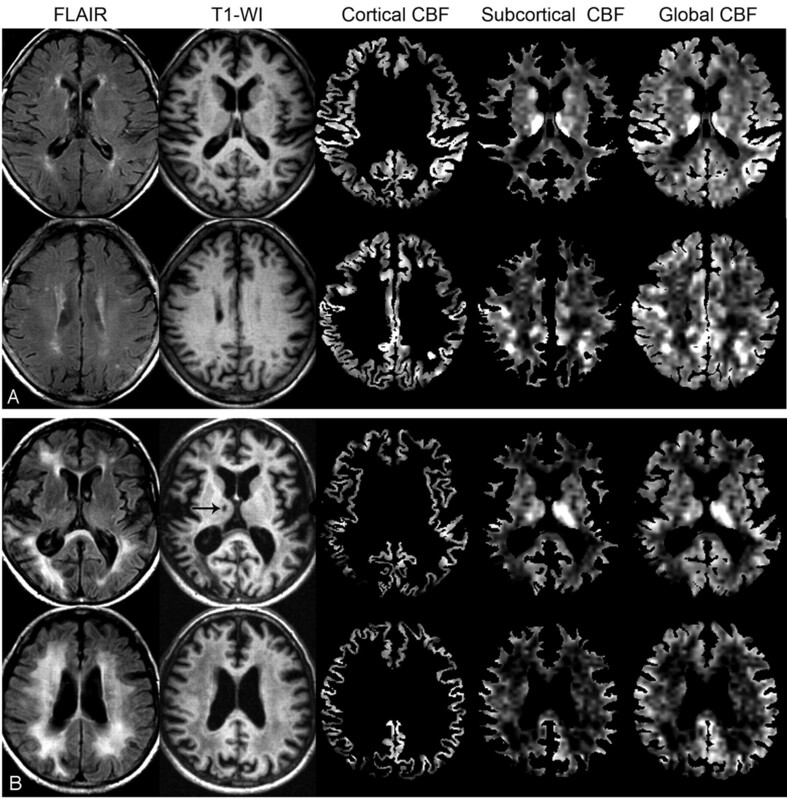 Also note the perfusion differences between subject 18 (with diffuse confluent WMH on FLAIR images) and subject 4 (with punctiform WMH on FLAIR images). Finally, on the subcortical and global CBF images from subject 18, note the relative hypoperfusion of the right thalamus, where a lacunar infarct occurs (arrow). Note:—AD indicates Alzheimer disease; VaD, vascular dementia; AA, angiotensin antagonist; β-Bl, β-blocker; CA*, calcium antagonist (*diltiazem); ACE inhibitor, angiotensin-converting enzyme inhibitor; WMH, white matter hyperintensities; CBF, cerebral blood flow. † Higher values indicate greater severity.